The Glamis Sand Dunes in southern California is a hotspot for UTV riding, many riders travel from all across the country to join sand enthusiasts at this premier destination. With over 150,000 acres of OHV riding it’s easily one of the largest dune complexes in North America making it a great home for the annual Camp RZR event. With their Polaris RZR side by sides equipped with the latest Pro Armor UTV accessories, the Pro Armor team heads to Glamis for Camp RZR. In this video the guys hit the dunes to enjoy a little sand slingin action; the vast riding area allows them to open their machines up for some fast fun. Not only is it a great opportunity for the guys to get out and have a good time, it’s a great way to test the durability and dependability of Pro Armor products in the field. Pro Armor is an industry leader in aftermarket UTV products, from bumpers and cages to doors, tops and even tires; you can count on dependable, quality accessories to upgrade your SxS. 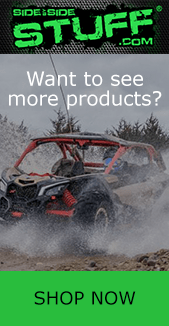 At Side By Side Stuff we offer a variety of Pro Armor products for a variety of machines; including the Polaris RZR, Can Am Maverick X3 and Kawasaki Teryx. Shop our selection of Pro Armor UTV products today.